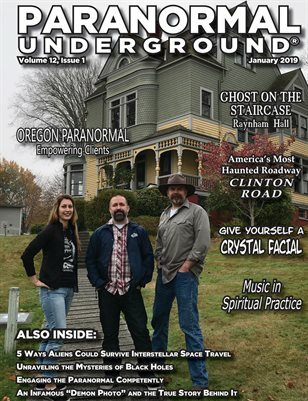 In this issue of “Paranormal Underground” magazine, we spotlight Oregon Paranormal and its investigations; film director Nassim Abassi and his upcoming movie “Once Upon a Missing Time,” based on the book written by UFO researcher Philip Mantle; and science fiction romance author S.E. Smith. In our Case Files of the Unknown, we feature haunted Clinton Road in New Jersey, 5 ways aliens could survive interstellar space travel, and the story behind the legendary “Brown Lady of Raynham Hall” ghost photo. And, in our Special Report, we take a look at how to engage the paranormal competently. For a 12-month PDF subscription to Paranormal Underground magazine, visit paranormalunderground dot net!